Five high school seniors spent a week in October at the Levy Preserve as part of the Ministry of Education’s job training experience. 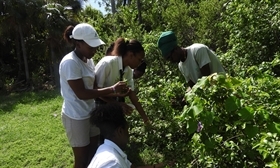 The students, from Central Eleuthera High and Harbour Island All Age Schools, joined botanist, Dr. Ethan Freid, in the Preserve’s Conservation Horticulture Program. They spent the week learning about endemic plants, collecting fruits and cleaning seeds in preparation for planting, as well as planting and caring for seedlings. The students also learned some basic plant morphology and taxonomy of Bahamian palm trees. The students enjoyed a morning of ornithology, learning about the uniqueness of birds, their importance, and common threats birds face. Using the field guides and binoculars the seniors were able to identify some of the common residents and migratory birds that call The Preserve home. Rounding out the week, students travelled south to Lighthouse Point to gather their impressions on conservation and protection of areas with great biodiversity....and to enjoy a bit of snorkeling!